Burial jars at the Plain of Jars in central Laos. A joint research team from Australia and Laos has uncovered a new set of human remains on the Plain of Jars, believed to date back to the Iron Age, some 2,500 years ago. Scientists say the field work has added a significant amount of knowledge towards unraveling the mysteries of about 100 jar and mortuary sites spread across the region. The Plain of Jars, located in the central Lao province of Xieng Khouang, has remained a puzzle to archaeologists. Little is understood of the people who carved the jars from the quarries or even the initial contents and how the sites came into existence. O’Reilly said a key question is that there are no known sites offering clues to the ethnicity and identity of the people who created the stone jars. About 100 sites each contain between one to 400 stone jars. The latest field work uncovered an ancient burial ground in a region known as Site 1 [One] in Xieng Khouang Province, with more than 300 stone jars, stone discs and markers. 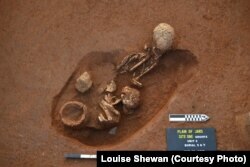 Excavation uncovered varied burial methods, including internment of whole bodies, the burying of bundled bones and bones placed inside ceramic vessels and buried. The field work included a team led by Monash University archaeologist Louise Shewan, as well as a Lao team led by Thonglith Luangkhoth, archaeology division director with the Lao Ministry of Information, Culture and Tourism. Primary burial at the Plain of Jars in central Laos. Thonglith told Lao media the newly uncovered remains and artifacts were found about eight kilometers from the center of Phonsavanh district. “This discovery marks a significant milestone since archaeological excavations began in the area in the 1930s in collaboration with a French archaeologist,” he said. The French archaeologist, Madeleine Colani, produced two publications from her field work that have become a major contribution to modern archaeological work. Investigations and field work to unravel the mysteries in recent decades have been hampered by tons of unexploded ordnance left over from the Indo-china War of the 1970s. But O’Reilly said he hopes the renewed work will change all that. Isotopic and chemical analysis on the remains may provide information on the ethnicity of the people linked to the sites. “This really should be able to expand our understanding and as the project progresses perhaps we’ll get more and more information to answer those questions,” O’Reilly added. He said there is speculation the Lao sites may be linked with similar jar sites located in India’s northeast region of Assam. “For everybody involved we’re really excited to have the opportunity to work at one of South East Asia’s most important archaeological sites and probably one of the [region’s] least understood archaeological sites,” he said. The project, funded by the Australian Research Council, will continue over five years with field work in more remote regions of Laos, as well as sites in northeastern India in collaboration with Indian archaeologists. From there, a comparative analysis may offer a chance to unravel one of Southeast Asia’s great cultural mysteries.